For the AAN patient magazine, Neurology Now, I recently interviewed people with neurological disabilities who experienced violations of their rights in the workplace. Until then, I had little understanding of the complexity of the issues surrounding the Americans with Disabilities Act (ADA) or how its disregard could devastate disabled employees. Employment is one of the most important aspects of our lives, and especially critical for patients with neurological disabilities who need health insurance benefits to cover the costs of care and medications. So what can we do to support our patients who want to continue to work? “Physicians can be extremely helpful to patients who are having workplace problems caused by disability,” Charles D. Goldman, Esq., a Washington, DC, attorney with expertise in disability law, told Neurology Today. However, it is important to understand the law. Title I of the ADA prohibits employment discrimination against qualified individuals with disabilities and applies to private employers with 15 or more employees. In fact, many states and counties also ban discrimination by employers with fewer than 15 employees. An individual with a disability must be substantially limited in one or more of his or her major life activities. To be covered, they must show that they have a condition — mental or physical — that substantially limits them in a major life activity such as walking, seeing, breathing, or caring for themselves. However, they must also demonstrate that they are still qualified for the job, with or without reasonable accommodation. A reasonable accommodation is any change in the work environment or in the way a job is performed that enables a person with a disability to enjoy equal employment opportunities. The ADA requires employers to provide reasonable accommodation for individuals with disabilities if requested by the employee, unless it would cause undue financial or administrative hardship. Neurologists are generally asked to weigh in on which accommodations are required for a disabled person to continue to work. “If the problem is stamina and energy, doctors may want to recommend that the person work from home part of the time,” said Goldman. Many companies have work-at-home policies that offer the option one to two days a week; if your patients are easily fatigued, breaking the workweek up may help them recharge their batteries, he suggested. When Keer was 39 years old and had increasing fatigue, he asked his employer, a governmental agency, to allow him to telecommute part of the day. He also asked for a large screen monitor for his desk at work because of his deteriorating vision. While he awaited a response, he exhausted all his vacation, sick, and leave time. He had consistently received outstanding job evaluations, and his work ability had never been questioned, but his appeals were ignored. With Goldman's help, Keer eventually reached a settlement that would allow him to go back to work in a comparable position in another division of the agency, but the ordeal itself was traumatic. “I was fortunate because I had a neurologist who helped me document my circumstances,” recalled Keer. Catherine List, diagnosed with early-onset Parkinson disease at age 46, desperately wants to keep her job. But over the past five years she developed difficulty writing and typing, which interfere with her ability to complete her record-keeping duties as a school speech and language therapist. She requested voice-recognition software and additional time to complete paperwork so that she could continue to do the work she loves, but has not yet been given these accommodations. List, who recently had to take a medical leave of absence, is grateful to her neurologist, Lily Jung, MD, who wrote letters and completed forms on her behalf. “It's pretty frustrating trying to find time as a busy clinician to do this, but the alternative is that your patient loses out,” said Dr. Jung, medical director of the MS program at the Swedish Neuroscience Institute in Seattle, WA. Dr. Jung said that it sometimes helps to work directly with the human resource departments and the patients to figure out how to keep patients employed. Occasionally, this means a referral for vocational counseling or for retraining. Dr. Jung pointed out that while it's time-consuming to advocate for patient work rights, it's much more challenging for patients themselves. “If you're unsure about what to say when you're asked about accommodations, contact your local chapter or the MS Society (or other patient organization),” Goldman advised. He also directs physicians to the Job Accommodations Network (www.jan.wvu.edu) of the Office of Disability Employment Policy of the US Department of Labor, for job accommodations guidance, options, and practical solutions. Controlled epilepsy poses an even more difficult situation for working patients, said Gary Gross, director of the Epilepsy Foundation's Jeanne A. Carpenter Epilepsy Legal Defense Fund. The application of the ADA was greatly narrowed in 1999, he said, when the Supreme Court determined that conditions controlled by medication (such as epilepsy, diabetes, mental illness, or even cancer) will not be considered covered disabilities under the ADA, unless they result in a substantial limitation in major life activities despite the treatment. Gregg McGlasson, a correctional deputy in Riverside County, CA, was terminated in March of 2003 after he had a seizure even though he had been cleared medically to return to full duty. The sheriff's department assumed that continued employment in the position would pose an unacceptable safety risk. While safety concerns are a legitimate interest of the employer, employees and applicants with disabilities may ask for reasonable accommodations if they constitute cost-effective adjustments to the workplace environment. Accommodations for people with epilepsy may include breaks to take medication or leave to seek treatment or adjust to medication; providing a private area to rest after a seizure; installing a rubber mat or carpet to cushion falls; making adjustments to work schedules to avoid sleep disruption; allowing work at home; and reassignment to another open position for which the individual is qualified. Dr. Jung helps steer her patients to advocacy groups, which provide information and support, and to lawyers who specialize in disability and employment law. Some organizations representing persons with neurologic conditions offer assistance or guidance in legal matters. McGlasson received legal help from the Epilepsy Foundation's Jeanne A. Carpenter Epilepsy Legal Defense Fund (www.epilepsylegal.org). It took three years, but he was finally reinstated, credited with back pay, and his benefits and retirement plan were restored; he also received additional compensation for all that the County had put him through. Although the outcome was positive, the ordeal was very stressful for McGlasson and his family. The ADA Restoration Act (H. R. 6258), which was introduced at the end of the last session of Congress in 2006 to fix the problem of defining who is considered to have a disability, was intended to restore the original intent of the ADA. No action was taken on the bill then, but advocates hope that a similar bill will be introduced in Congress in the near future. “During a recent Epilepsy Foundation conference there was excellent presentation on this act,” said Palatucci graduate Brien Smith, MD. “However, many physicians there commented to me how little they understood about what had happened to the ADA,” he noted. As chair of the Government and Legal Affairs for the Epilepsy Foundation, Dr. Smith is organizing a Professional Epilepsy Advocacy Network that will include physician representatives from the AAN, the Epilepsy Foundation, and the American Epilepsy Society. 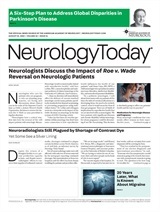 Neurology Today7(15):18-19, August 7, 2007.